Two common options available to facilities for cleaning and sanitation are cotton and microfiber. However, these materials are not created equal. Microfiber offers many benefits over cotton for dust and infection control, and it’s also eco-friendly. This isn’t to say cotton isn’t a quality material, but when it comes to a commercial setting, microfiber is ideal. Microfiber is one of the top materials for infection and dust control. It picks up 99% of debris and bacteria, and helps prevent the spread of infection. However, it has other benefits for commercial uses as well. It’s long lasting and easier to clean, which is important for commercial cleaning materials such as mops and towels. It’s also quick-drying and does not streak on glass surfaces. Cotton has many great uses in a commercial setting, but cleaning is better left to microfiber products. Due to the large looping of the material, cotton doesn’t pick up dirt and bacteria as well. Good commercial uses for cotton include spas and gyms where they can be used by guests. 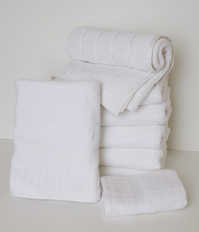 Cotton is also popular for bath towels due to its comfort and softness. But when it comes to mopping up a spill or sanitizing surfaces, microfiber out-performs cotton by a long shot. Depending on your building or facility, having both microfiber and cotton products may be beneficial. Gyms often utilize cotton towels for their guests, but use microfiber mops and towels to sanitize the facility. However, in settings where mops and towels are only needed for cleaning, your best bet is to invest in a microfiber system. Want to learn more about how microfiber can help prevent the spread of bacteria, germs, dirt and debris in your office or facility? Talk to the experts at Lord Baltimore, where we offer a microfiber infection control program that is second to none! For over forty years, Lord Baltimore has provided reliable, cost-effective uniform rentals solutions throughout Maryland, Washington DC, Northern Virginia, Southern Pennsylvania, and Delaware. We also offer microfiber mops and towels to complete your facility’s sanitation system. To learn more about how a microfiber cleaning system can benefit your company, please contact Joe Bateman at Lord Baltimore by calling 800-292-1224. This entry was posted on Wednesday, February 24th, 2016	at 5:33 pm	. You can follow any responses to this entry through the RSS 2.0	feed. Both comments and pings are currently closed.